1. The cost in relationships. "A disciple must subordinate all earthly relationships to loyalty to Christ. Jesus' remark is an example of Hebrew hyperbole to emphasize the subject being discussed. To 'hate' one's family is … but a way of expressing the importance of allegiance to Him" - J. Lyle Story, commentary on Luke, New Spirit-Filled Life Bible, p. 1417. 2. The cost in vocation and destiny. 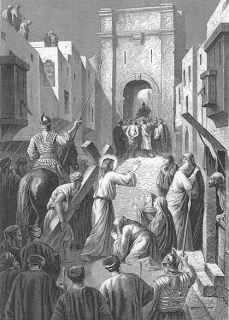 A disciple follows Jesus carrying his cross - Luke 14:27 (not a suitcase, or a ladder, or a sword, or a throne… ). I see this as Jesus' way of foreshadowing to the disciples how He would die, and telling them that discipleship may well be their death sentence too (as opposed to a means to security, success, power or glory). 3. The cost in possessions. The disciple forsakes all that he has (Luke 14:33). This sounds like turning one's back not only on possessions but also dreams, goals and ambitions. "Discipleship means the total renunciation of all selfish interest for the sake of Jesus. 'Cannot be my disciple' is dealing with issues of total commitment and maximum realization of Christ's purpose for our lives in this life' - Ibid. As I try to superimpose my North American lifestyle on this stark template of discipleship, I ask, has my discipleship affected my loyalties? Do I view it as a possible death sentence? Is everything in my life (possessions, home, time, plans) subservient to following Jesus? Now that I've looked at the cost, do I wish to carry on? PRAYER: Dear Jesus, as I compare my life with Your cost, I see that my view of discipleship (at least my way of living it out) may be unrealistic. But with Peter, I say, "To whom shall we go? You have the words of eternal life" - John 6:68. Help me to be a more realistic disciple. Amen.